Recently, my blogging friends Terri and James over at Gallivance impressed me with their glowing tribute to the Balinese flower-mandala. 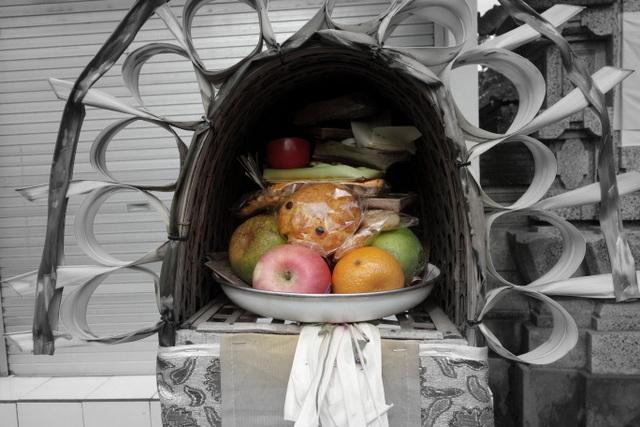 So much so that I felt inspired to gather up a little collection of my own – an array of shrines, called sanggah penjor, that Balinese families erect and decorate for the bi-annual festival of Galungan. They are gloriously decorated, imbued with items that are meant to express their unwavering gratitude to the gods – and hope for a better, healthier and more prosperous future. Each sanggah is affixed (at about shoulder height) to, or next to, the penjor in front of their home. Then, each is filled with an assortment of offerings, ranging from fruit and cookies, from flowers and rice cakes, to muffins and cigarette packs. Why the Balinese believe that their deities need a pack of Marlboros or oranges imported from California is anybody’s guess!